Many Germans found Kohl refreshingly unassuming and thought of him as one of their own as he worked to achieve a greater respect for Germany in the international community nearly half a century after World War II. Helmut Kohl, the West German politician who became an unlikely international statesman when he helped unite Communist East Germany with the West after the fall of the Berlin Wall in 1989 and served as chancellor of a unified Germany for much of the 1990s, died Friday at his home in Ludwigshafen. He was 87. Kohl’s party, the Christian Democratic Union, confirmed the death in a tweet but did not provide other information. 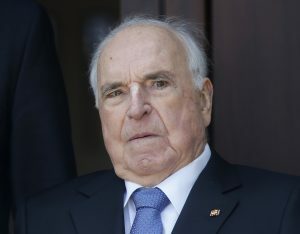 Helmut Kohl, shown in 2014, helped unite Communist East Germany with the West after the fall of the Berlin Wall in 1989 and served as chancellor of a unified Germany for much of the 1990s. Kohl did not attract many superlatives during his years as West German chancellor in the 1980s. His uninspiring public speaking style and a sometimes clumsy political manner often worked to undermine his efforts at achieving what he called normalization, a greater respect for Germany in the international community nearly half a century after World War II. His insistence in 1985 that President Reagan visit the German military cemetery in Bitburg, where members of the Waffen-SS were buried, did little in the United States to build confidence in his leadership. Neither did his likening the next year of Soviet leader Mikhail Gorbachev’s public relations skills to those of the former Nazi propaganda chief Joseph Goebbels. Kohl later said he regretted his comments but at the time they set off a furor in the Soviet Union, which was working on relaxing tensions between the free and Communist worlds. Kohl’s public relations gaffes made his opponents in politics and the media present him as a buffoon or a mediocrity. Succeeding the worldly Helmut Schmidt as chancellor in 1982 only threw Kohl’s perception problem into sharper relief. Although the left and West German elites made fun of Kohl’s middle-class appeal, many Germans found him refreshingly unassuming and thought of him as one of their own. In his early years at the helm, Kohl seemed to fulfill the expectations of his opponents and critics. He followed a centrist path with moderate cuts in government spending and supported his country’s long-standing commitments to NATO. Most controversially, he defended, despite opposition of peace activists, his government’s decision to allow U.S. nuclear missiles to be stationed on West German soil. Kohl’s legacy seemed to change overnight with the collapse of the Berlin Wall on Nov. 3, 1989, which for 28 years had stood as one of the most visible symbols of separation between Western Europe and the Communist bloc of eastern European countries. Visiting Warsaw at the time, Kohl was taken by surprise at the protests in East Germany that led to the wall being torn down, a period when the Cold War itself was coming to an end because of the dissolution of the Soviet Union. Severely weakened politically and facing intraparty opponents trying to topple him, Kohl seized the opportunity to transform himself into a leader of international stature and thereby strengthen his position in his own country. When Kohl visited cities in East Germany in the months after the wall fell, thousands of people greeted him with chants – unusual for Germany where even the most charismatic of speakers seldom face enthusiastic mass rallies. But Kohl told them what they wanted to hear: Unite the country. Charles S. Maier, an expert on European history at Harvard University, said Kohl’s greatest moment was the speech he gave to the West German Parliament on Nov. 28, 1989, that called for a 10-point plan that would lead to unification. In drafting his speech, which was a symbol of his new leadership approach, he had consulted no other foreign leader except President George H.W. Bush before issuing his call for Germany’s unity. The French and British, frightened by the potential a combined Germany might have to dominate Europe, denounced the concept and pushed the Americans to disavow Kohl’s plan. Instead, Washington embraced the idea wholeheartedly. Leaders found it impossible to stop the momentum generated by East German protesters desperate to enjoy the affluence and freedom of the West. By October 1990, unification was done, not at least because Kohl allayed the fears of his NATO allies and especially the Soviet Union. To the Russians, Kohl gave billions of Deutsche marks for withdrawal of their troops from East Germany. 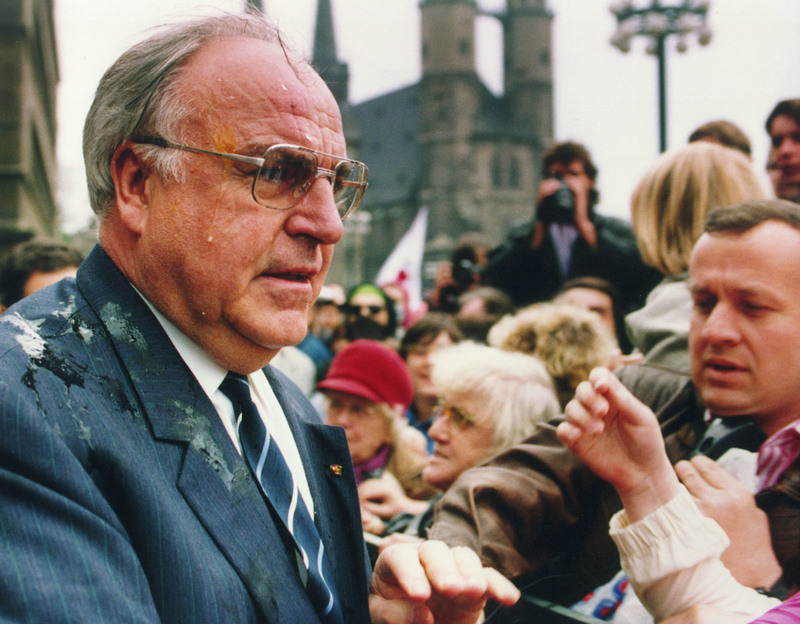 German Chancellor Helmut Kohl looks dismayed after he was hit by eggs in Halle, eastern Germany, in 1991. Demonstrators threw eggs and bags at the chancellor as he was entering the city hall in the industrial region where many people were unemployed. Kohl sought to mollify his Western European allies by committing a unified Germany to more powerful European institutions that could exercise authority over the continent’s economy and several policy fields. He called reunification and European integration “two sides of one coin” and was successful in pushing the euro as a common European currency, not least to appease France’s concerns about a strong Germany. The reality was that German unification proved extremely expensive. Residents of the former East Germany struggled with high unemployment rates – which remains a problem – and neo-Nazi violence. Psychological and sociological differences continued to divide the country. Kohl was elected chancellor four times and, supported by a network of loyal political friends, he was the unchallenged leader of Germany’s moderate conservative Christian Democratic Party, or CDU, for more than a quarter of the 20th century. There were many friends he promoted to top jobs. In return he expected absolute loyalty. Whoever tried to challenge his position in his party gambled with his own political future. When opponents in his party tried to force him out of office in 1989 in an attempt to change the balance of power within the party, he delayed a prostate operation and visited a party convention despite suffering great physical pain. He was successful. Helmut Michael Kohl was born to conservative Catholic parents on April 3, 1930, in Ludwigshafen, a small city along the Rhine River in western Germany. He grew up in humble origins in a household headed by his father, Hans, who worked for the tax and revenue office of Ludwigshafen and also fought in both world wars. Hans and his wife, Cäcilie, raised Helmut together with an older brother and an older sister. Kohl’s early life was shaped by the bombing raids of Allied planes during World War II. He never forgot about exhuming entombed dead bodies out of ruins together with other teenagers working for the youth fire brigade. During the closing months of the war, he was a member of the Hitler Youth and drafted into an army training camp but never saw combat. His older brother, Walter, died in 1944 at age 19 while serving in the German army. After his studies of law, political science, sociology and history, Kohl’s political career advanced in the CDU and by 43, he was national chairman. Along the way the act of categorizing people into supporters and opponents, good and evil, was a hallmark of Kohl’s approach to politics. He even had drilled his German shepherd Igo, as neighbors reported to a journalist, according to that world view. To the command “Christian Democrat” the dog was friendly and wagged his tail. The command “Soz” – Kohl’s favorite word for Social Democrats and others to the left of his party – caused the dog to bear its teeth and snarl. A rare setback for Kohl was his 1976 loss to Helmut Schmidt, a member of the Social Democratic Party, for the position of West German chancellor. Six years later, as Schmidt faced a political crisis, Kohl won the chancellorship after building a coalition with the Free Democratic Party, Germany’s liberal party, as a junior partner. In office, Kohl seemed at times to lack the historical sensitivity required for such a high-profile job. Some of his normalization efforts met with howls of outrage from American and Jewish groups. One of his greatest stumbles was the controversy surrounding his 1985 visit with President Reagan to a German military cemetery in Bitburg. The state visit by Reagan was intended to celebrate the normalization of relations between the United States and Germany on the 40th anniversary of the end of World War II. But a public relations disaster ensued when it was revealed that the cemetery contained the graves of 49 members of the Waffen-SS. Secretary of State George P. Schultz wrote years later in The Washington Post that Kohl exerted tremendous pressure on Reagan to go through with the visit. Ultimately they visited the cemetery and the Bergen-Belsen concentration camp. Within Germany, Kohl was facing opposition to his attempts of normalization. Opposition leaders won energetic cheers by arguing that unification should not mean an end to the low profile that Germany’s military has kept since World War II. In the early 1990s, Kohl argued for a constitutional amendment giving the German military the clear right to participate in international humanitarian actions. He did not get the necessary two-thirds majority in the German Parliament, but the Supreme Court ruled that for peacekeeping missions the constitutional amendment is unnecessary. For much of his career, Kohl was accompanied by his wife for 41 years, the former Hannelore Renner, who committed suicide in 2001. She suffered from a painful and incurable skin condition that forced her for years to live in a shaded house and avoid sunlight. In 2008, Helmut Kohl married Maike Richter, a public official and economist 34 years his junior. A complete list of survivors was not immediately available. Almost immediately after his resignation, Kohl was entangled in a financial scandal involving several million dollars in illegal donations to the CDU during his time in charge. His party faced high penalties by the parliamentary administration and lost political credibility because Kohl, citing his word of honor, refused to mention the names of his donors, who had wanted to remain anonymous. The scandal deepened when it was revealed that many relevant files had either gone missing or been destroyed. Kohl deflected blame for the scandal, saying that opposition parties wanted to damage the achievements of his administration. But in 2001 he agreed to pay a fine of about $143,000 and acknowledged a “breach of trust” for illegally accepting cash donations for his political party. In return, prosecutors dropped criminal charges. 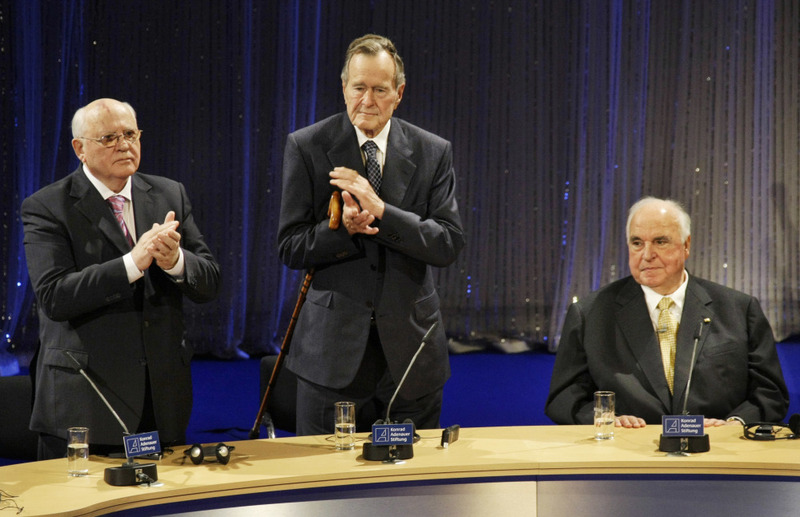 One result of the scandal was the decimation of a generation of CDU leadership tarred by association with Kohl. An East German politician and Kohl protege, Angela Merkel, then became the first woman to head the CDU.